Today the International Astronomical Union (IAU) announced the official names for Pluto's two most recently discovered moons. The temporary names P4 and P5 have been replaced with Kerberos and Styx respectively. These days the IAU doesn't get to make their decisions in isolation or without public pressure. People want to have their say and are quick to criticize unpopular decisions. And of course many Pluto fans are still getting over the whole demotion thing. Last year there was a public vote for new names for Pluto's moons. By far the most popular was "Vulcan", supported by William Shatner. Not for the first time, the IAU ignored public opinion and went with something different. Did the IAU get it right? I think so. I'm a Trek fan and it's always fun to watch William Shatner get excited about anything, but in this case Vulcan would have been the wrong choice. In the 19th century Vulcan was the name given to a hypothetcal planet inside Mercury's orbit. Although the planet turned out not to exist, the term "vulcanoid" is still associated with objects very close to the Sun (which does not include Pluto's moons). In Star Trek lore Vulcan is a very large, hot planet, totally unlike Pluto's moons. There is a long-standing convention of naming planets after Roman gods and moons after Greek gods. Vulcan is a Roman god so it would break the convention. Astronomical names need to last a very long time. Will the Star Trek reference still be relevant even in 5000 years? I hope so but I wouldn't bet on it. Kerberos and Styx are good, relevant names. Both in astronomy and Star Trek, Vulcan is strongly associated with heat. 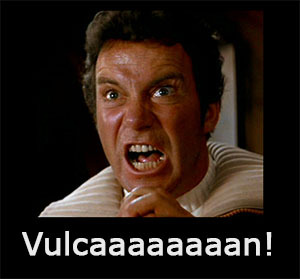 It's not logical to name an icy moon Vulcan. Let's save the name Vulcan for a hot extrasolar planet orbiting close to its star. That would be a fitting tribute. Vulcan's time will come, we just need to be patient.